While last year I lived in an apartment in my school’s asrama (dorm), this year I am living in a rumah (house) in the neighborhood behind my school. Not only is this my first time living in an actual house outside of my parents’ home (I was always an apartment girl in college); it is also my first time living well and truly alone. (which my neighbors are always reminding me to lock, even though there is nothing outside of my house worth stealing), and a tiny porch stoop where I’ve set up some plastic chairs to sit on in the evenings while I read and wave hello to the people in my community. Inside, there is a front room for entertaining visitors, a room which might be for eating in (it currently houses a table, a broken chair, the water cooler and the refrigerator), a bedroom with its own bathroom, and a weird extra room which I think my school intended me to use as an office (there is a desk in it). The dapur (kitchen) is in a large, semi-outdoors room in the very back of the house, where every night I menumis (stir fry) the sayur (vegetables) I buy at the local pasar (market), hang my laundry to dry after handwashing it in a giant plastic tub, and battle the kecoa (cockroaches) and tikus (mice) which are determined to become my housemates. 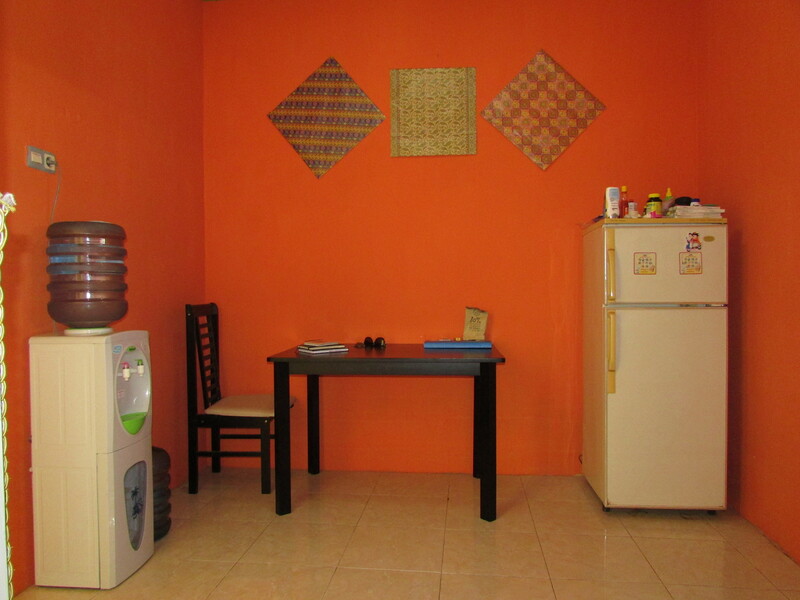 Prior to my moving in, my school furnished my house with everything I needed (and a decorative tree in the front room to boot) and painted some of the walls a particularly warm shade of burnt orange (the interior walls are the same color as the exterior of the house, something I am learning is actually quite common here in Gorontalo), so I was certainly not moving in to a bare and boring house. Since then, I have also found small ways to make the house more my own. I’ve hung peta (maps) in the front room, and pieces of batik-patterned wrapping paper in the dining room (ish) part of the house. But while maps and batik add color to the walls, it is the living creatures who have come to share my house that makes it most homey. Tossed on top of a pile of bricks along the side of my house, I found two spiky, presumably dead plants. I’ve always loved having plants around, so even though they looked like a lost cause, I set them up by my front porch and started watering them every day and using the tea leaves from my morning cup of caffeine as fertilizer. Lo and behold, little bits of green appeared. One of the plants still needs some tender loving care, but the other has responded well to the extra attention, and adds a little greenery to the dry-season dust that is outside my house. I have also managed to somehow adopt a cat. Last year, I was known for loving kucing far more than was considered normal, but this year it seems I have taken it to the next level. There is a particularly friendly and surprisingly clean stray who started coming around in the evenings, asking if he might share my supper (everyone was always bringing me two much food anyway, so I really didn’t mind). At some point, tossing bits of ikan (fish) and tahu (tofu) his way turned into my buying canned cat food for him (it’s insanely cheap here, which is how I justify this to myself), and now he is as much a part of my front porch as my plants (my doormat has been officially commandeered as his bed). He is missing part of one ear, and has a scar down the length of one leg, which the more romantic part of me has determined is very like an old naval ship captain, and thus I have named him Admiral James Anthony. 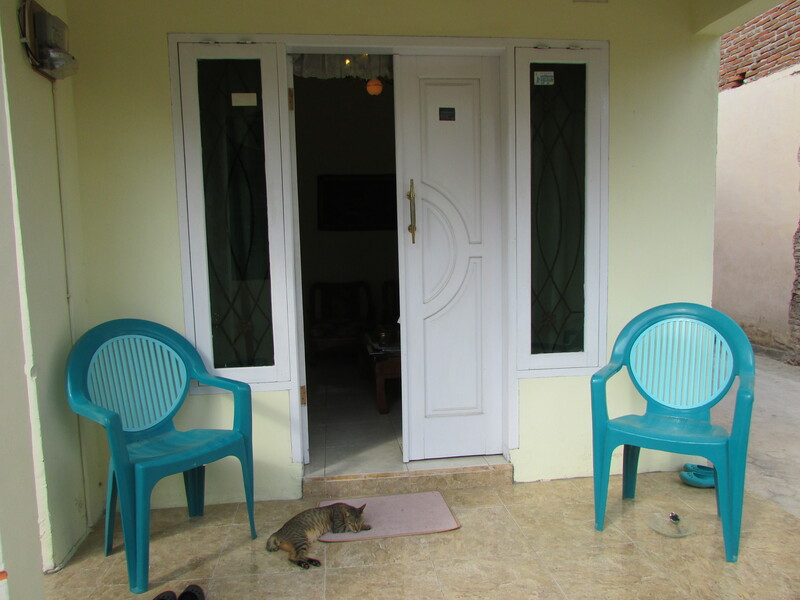 In contrast to his very pretentious Western name, I generally talk to him in very informal Indonesian: Admiral is the first living creature to get the rundown of my day. He is also often the last living creature I see at night, as he curls up purring in my lap while I journal, work on lessons, and (less often than I should) write blog posts. I still send him outside at the end of the night (I will only be here for nine months, and I don’t want him to forget he is a street cat and not do well when I leave), but I do let him into the front room, and he loves to sprawl across the cool tile during the heat of the day. Whenever students ask me if I am afraid to live alone, I tell them I don’t: I live with a really great friend with whiskers. 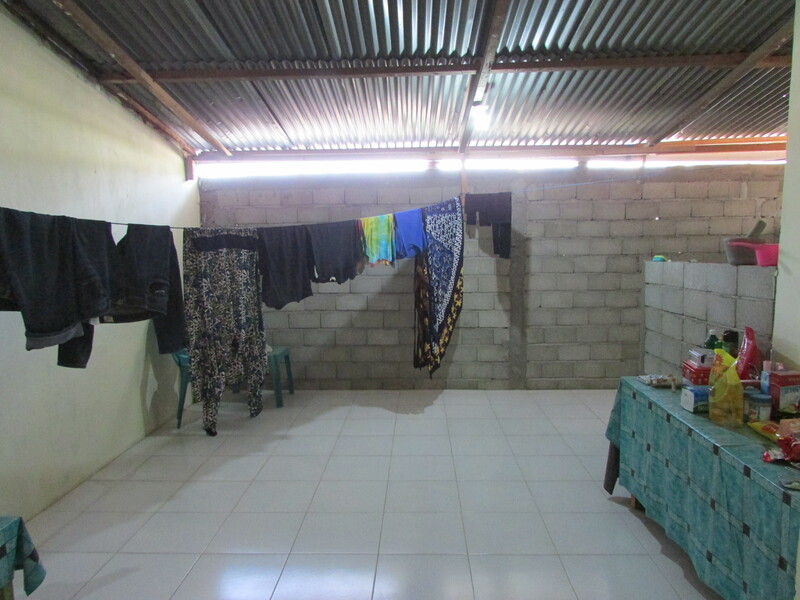 Living in a more traditional Gorontalo house does present a few new daily dilemmas, to which I’m learning to adapt and embrace as part of my new life here. Because houses here are fairly open (there are holes cut into the walls near the ceilings to help ventilate the house—completely necessary, considering how hot it is), critters can easily crawl on in, and dust is always blowing into my house, (especially because it is dry season now, and has not rained for months). Sweeping and mopping is all part of a daily routine here. Generally, it doesn’t bother me all that much, although I must say, having to rinse my bathroom of the coat of dust that has settled on it throughout the day (like my kitchen, my bathroom is strangely open to the elements) before I can shower is not my favorite thing in the world. Due to daily mati lampu (blackouts), I have to make sure I keep a bucket of water in my kitchen to use to wash my dishes (no electricity means no water), and hand-washing my clothes is one of those chores that requires a decent soundtrack (though when it is all hanging to dry it makes my back room look something like a pasar, which I’m rather fond of). Much of this (hand-washing clothes, fighting with insects, planning around mati lampu) is already familiar to me, since I did the same thing last year. Having a house just means that I contend with all of this in a much larger space. And all of this is not to say that having a house in Indonesia is so much harder than having one in Central New York. It’s just different. I might be battling excess dust and cockroaches, but I certainly won’t have to shovel snow to get out of my house come November. No complaints there. Living in my first house on my own is not always the easiest (I’m very behind on the weeding that needs to be done in front of my house, and I have yet to master the entertaining-by-candlelight that happens during mati lampu), and there is no denying I sometimes miss the constant company I used to live with (either in the form of roommates or my students last year), but I would not trade the experience for the world. I love the independence it gives me, and the feeling that I am truly an adult member of a community. I’m also strangely puzzled by my toilet, which is a Western-style toilet, but does not flush. I have to scoop water into it in order to do so… making it a sort of Western/squat toilet hybrid which I’m not entirely sure is better than a squat toilet. It’s certainly unique, however, and I’m kind of into it because of that. It is worth noting that while my living situation this year is fairly Indonesian, it is not the living situation of every Indonesian in my neighborhood. While the other teachers and the police families who live in my neighborhood all seem to have indoor plumbing and air conditioners in the bedrooms, there is a well behind my house that seems to be shared by a few of the families in my area; someone is always washing dishes or laundry there, in the company of ayam (chickens) scratching at the dry ground, not fifty feet from the neighborhood trash pile. Meanwhile, I have a beautiful house to myself, complete with a pseudo-Western toilet. The division is very noticeable; this is something I will continue to reflect on throughout my year here.